Here are a few ways to sneak more water into your day. You may think water tastes boring, and you’ve heard of the old ‘add lemon’ trick. But there are so many other ways to dress up water. Try cucumber, mint and jalapeno. Or gingerroot, rosemary and lemongrass. There are tons of online recipes for infusing water. 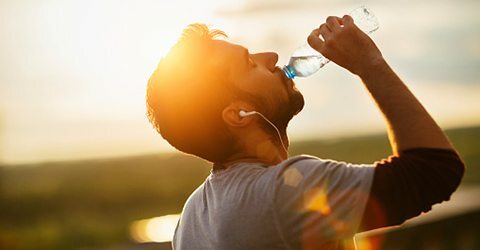 In addition to warm In addition to warm weather and humidity, exercise, caffeine and alcohol can also cause you to dehydrate. If a few lemons (or jalapenos) will get you to drink more water, slice away! Instead of a diet soft drink with your lunch, have a glass of water instead. The human body can process an estimated 15 liters of water every day, but don’t overdo it. Too much water can cause hyponatremia, which is a decrease in sodium and potassium. A water bottle can be a great way to keep track of how much you’re drinking since the ounces or liters are usually indicated on the bottle. Trying to avoid plastic? Get a Mason jar. Measurements are right on the side of the glass. Want to keep it cheap? When out at a restaurant, just drink water. Sure, it may not sound as exciting as a piña colada or mojito, but you’ll stay hydrated and will be in a better mood when the check comes. Getting more water doesn’t always have to involve a bottle! Hydrate while getting your nutrients and antioxidants by slicing up some watermelon or munching on some celery for a snack. Watermelon is 92 percent water by weight, and celery has even more—95 percent! Dice up a zucchini; it’s 97 percent water, or peel an orange, which is 87 percent water.